Before toothpaste as we know it today, people tried several different things to clean their teeth. To name a few, egg shells, ash, ground oyster shells, and salt. 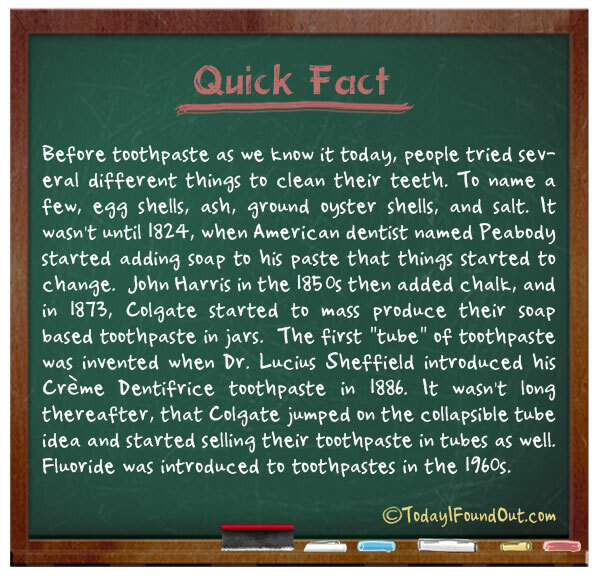 It wasn’t until 1824, when American dentist named Peabody started adding soap to his paste that things started to change. John Harris in the 1850’s then added chalk, and in 1873, Colgate started to mass produce their soap based toothpaste in jars. The first “tube” of toothpaste was invented when Dr. Sheffield introduced his Crème Dentifrice toothpaste in 1886. It wasn’t long thereafter, that Colgate jumped on the collapsible tube idea and started selling their toothpaste in tubes as well. Fluoride was only introduced to toothpastes in the 1960s toothpaste.